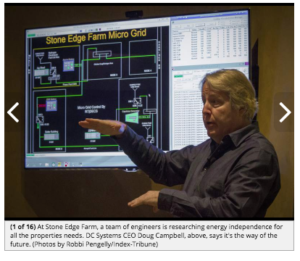 DC Systems is proud to provide the control software for Stone Edge Farm - a testing ground for future microgrid innovation. This implementation is unlike any other in the world, connecting a network of electrical services and integrating various forms of distributed energy generation (solar, microturbine, hydrogen fuel cells) and storage (batteries and hydrogen) with real time monitoring and control. 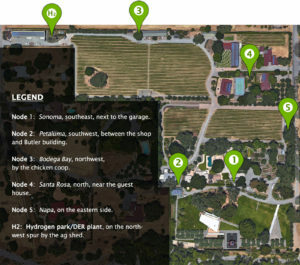 Like other microgrids, Stone Edge Farm's can operate normally, connected to and importing electricity from the utility grid, or disconnected from the grid, in island mode. It can also run as an island parallel to and open to the grid without contributing energy. What is unique is its "MicroGrid mode" - the ability to operate islanded while intentionally exporting energy onto the utility grid. While this has never been done before due to technological and regulatory obstacles, Stone Edge Farm is committed to realizing that goal.